I overslept in the morning and I nearly missed the plane in Okecie airport. Fortunately a friend, who gave me a lift to the airport, was determined enough, to knock at my apartment's door for almost 10 minutes. In Los Angeles at the airport I met a German DXpedition also going to Tonga! 5 people, good antennas, amplifiers, 3 radios, 4 laptops. 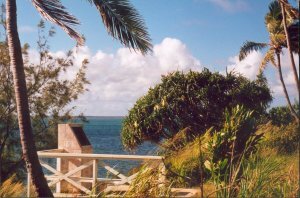 They will work CW, RTTY, SSB from Driver's Lodge in the centre of Nuku Alofa. 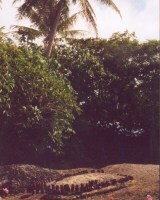 Intermediate landing in Apia on Samoa. Short stop, a few overweight Samoans boarded our plane - perhaps we will still manage to take off? 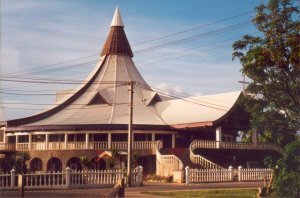 The time on Tonga is exactly 12 hours shifted in relation to Poland and it precedes it by one day. And we have a problem. Poland is not on the no-visa list and they're not going to let me on Tonga. Ukraine and Russia are on the list, but Poland is not! They send me back to Auckland for a visa. Germans are quite surprised, that a country almost in the European Union and such problems. Maybe we are the Third World after all? They are going to transfer me to the plane to Los Angeles in the evening. Finally I get the idea to call the Tourist Agency of the Kingdom of Tonga. Armanda faxes the visa form to the airport to someone called Peter, which is 5 pages - I am to fill it in and send it back. They'll send it to Tonga and I am going to get a visa promise. And the time still goes on - at 20.00 they booked me a flight to Los Angeles! The visa promise finally arrived, right on time. 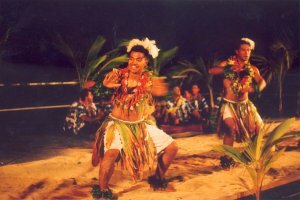 I am not going back to LA, but I am going to Tonga. We land in Nuku Alofa at 1.00 in the morning. I was given the A35E license. 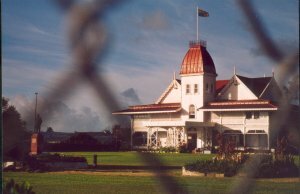 Prime Minister's office, in which they issue the license, is a small two-storey building in the centre of Tongatapu, the main island of the archipelagos. I got the license after three hours, one could select the suffix, if it was still free. Germans already have 800 QSOs. The conditions are terrible (big k index). I had to buy an adapter for the power source - they have different sockets. Taxi again to the airport to get the equipment and to Nawaii Ali, where I live and where there is a concert of local talents today. During the fixing of my antenna someone "borrwed" my pliers. 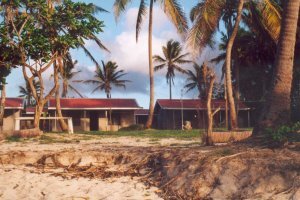 I haggled renting a bungalow for $30 a day, mediocre food, a bit monotonous. For now I hung the sloper for 10m. Because of the time difference and tiredness I can't sleep, so since 3 o'clock I setup HF9V. I finish it about noon and I immediately try 28 MHz. Some JA, little W. In such weak conditions the CQ machine is very helpful. 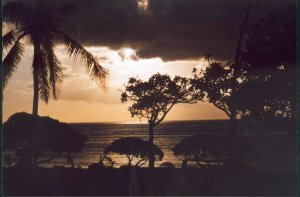 Several rains during the day, interlaced with the sun. In the morning at 18.50 UTC I hear HA1AG very well on 7MHz. 59 on the S-meter. He does not answer my calls. Awful condition. Proton storm. QSO in Polish with WH0EWX. I make cushion layers for my phones of a bandage, in order not to hurt my ears. Still weak conditions. The amount of spots: 90, A:30, k:2. After the local sunrise there is a propagation on 14MHz to UA6, YO, LZ. On 7MHz one can hear a lot of Europe, but it's impossible to contact anyone. The first sunny day during the whole time. A lot of various shapes and colors of shells on the beach. For some location the dedicated sloper for 10m is better than HF9V. 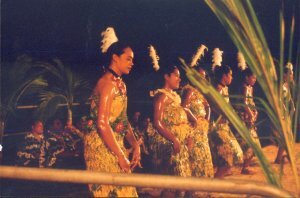 The locals constantly celebrate something - party men - kava (no to confuse with coffee), roasting pork, singing, dancing. Magnetic storm - zero propagation. A speaker in the CQ machine has died - I think it's from the humidity, as the air at noon almost liquefies. On ZK1 there are Swiss and they constantly wine about propagation and weather. I for once have sunny weather, and tomorrow I might just get the key to the bungalow. Until now it has been always open. Visit of the police. The browsed through my passport, license, credit cards. Long asking and cautions about thievery and phantoms(?!). They told me they were going to visit me again on the following day. Nice conditions on 21MHz, but no one from SP except for SP9WZJ doesn't call. Weird. 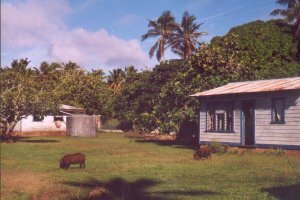 Life is very slow on Tonga. They do not fight for customers, they don't have any stresses, a good businessman would find an area to make a profit from. The police has brought a controller from their PTT. He said "No problem". How can one have 4 service people and one customer in one facility, and in a different one 6 customers and 1 service person? 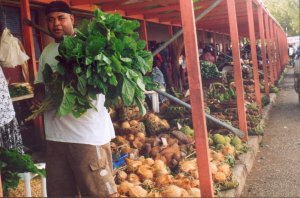 I am a pretty known local person - I enter a bus in the centre of Nuku Alofa going to Konakopulu in the north-western part of the island, where I live, and the bus driver, without my asking, stops in front of my facility. I visit DLs: good antennas and amplifiers, but their DX location seems to be worse than mine - in the centre of town. On the other hand - close to everywhere. Strong signals from UA3, UA4. 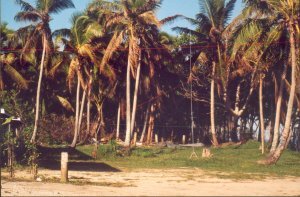 On the 21 MHz sloper hung from a 12-meter palm tree. JA and W signals are about 2S better than on HF9V. Once again it turned out that without DX-cluster's support a weak signal is invisible. 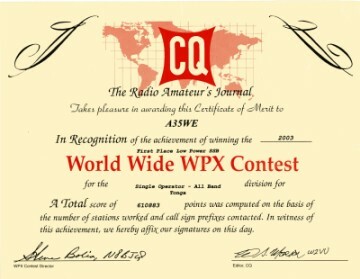 In CQ WPX Contest SP2FAX and SP7GIQ almost equal. Somewhat weaker SP9QMP, even weaker SP9LJD. 3Z6V doesn't receive me at all, others too. What does the power right mean! 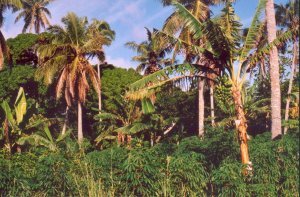 Catastrophe - the sloper has fallen down the tree - I had to bribe a local palm tree climber with seven dollars, so I could hang it once again. An obliging driver lit the terrain with car's headlights. Another wedding in my Nawaii Ali facility. My transmitting luckily doesn't interfere with the speakers system. A nice chat on the radio with Paul A35RK - a retiree from the USA, married to a Tongo inhabitant. A lot of station from VK/ZL only want to "chew the rags", they're not interested in exchanging cards. A35 for them is DX on 2 and 6 meters. 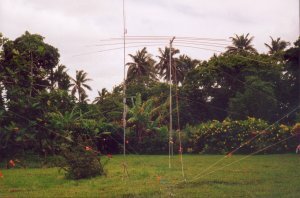 A was called by KH3/KT6E on 14 MHz - he complains about the propagation. On 21 MHz a meeting of three continents in Polish: A45XR, SP2FAX and A35WE. A ship of the "white people" has put in. Everyone is happy. There are tourists - there is money. My camera broke, and I made only a fraction of planned photos. There was an opening for the USA on 6m, but they can't hear 100W from vertical. Enthusiasts from 6m are still calling on HF and are trying to schedule skeds. Sometimes there is propagation. The best to JA. HF9V starts to malfunction. Salt water from the Pacific breeze and constant vibrations cause the equipment to get out of alignment. A commentary to the SPDX Contest: propagation to SP was on 14 and 21 MHz from 6.30 to 12 UTC. The goal was to check, how many SP stations searches for interesting DXs, so I only called CQ. Several times I probably was placed in the cluster. Nevertheless 33 QSOs from SP in the contests, including 4 stations on two bands. Very loud almost everyday: Victor ZK1CG, Moffet H44MD, Tony 3D2AG, KH6EJ, T30ONM, VR2KW. Unexpectedly W5AA/HP3 calls on 7 MHz. 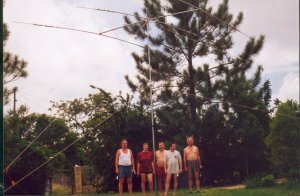 The skeds on 21 MHz were not successful, and without planning in both ways 59 on 7 MHz. SP9QMP on 40m calls for an hour 17.00-18.00. The signal in the beginning 58, it drops then, to 53, but he doesn't hear me, although I try all the time. In the evening a power shortage for 2 hours, when there was good propagation to W/K on 20m. Swimming in the morning, as usual, as there is no propagation, at all. Water so salt, that it keeps me floating itself, almost as in the Dead Sea. Some glass on the beach after the parties in the places, where there are facilities. Power shortages again in the afternoon for several hours. Index k-5 for the greater part of the day. Only 123 QSOs today - SP stations are a big part of it. I have been to Nuku Alofa again to visit an Internet cafe, buy several gifts and take the cash from the only cash dispenser in the whole country! There was a girl with a braid reaching the mid-point of her calf - what an unpolluted environment! I hunted down a big cockroach in my house - 5cm long. I left it on the floor, and something ate it during the night. I think I'll have to hunt this "something" down too. Great conditions on 7 MHz to the USA: WQ7X with 59, others similar. Better conditions. A long progress on 14 MHz until 2 in the morning, local time. After the sunrise swimming again in the lagoon with blue fish. 50 MHz to Japan is somewhat open. The HF9V antenna got it. Rain and wind, vibrations and salt caused it to get out of alignment. Wire slopers are better it these conditions. I finish work at 00.00 on the 15th of April with the result of 10 340 QSOs. It's time to think about the next expedition. I think in Autumn. No more expeditions to the Pacific. It's time for Africa or Caribbean Islands. A 600W amplifier would be useful. Adventures till the end: Lufthansa changed in the meantime the flight schedule and instead of 19.00 the flight from LA to Frankfurst was at 14.30. I would never make it on time. Fortunately the next flight (to Munich) at 16.00 was almost empty. They expose the luggage to such strong rays in LA, that they can damage the film. In Warsaw, the friend that was to get me from the airport, come 2,5 hours late. I think that's the end of my troubles.